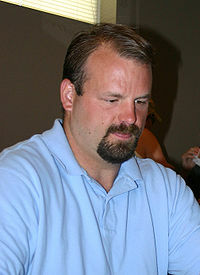 4 teams declined to sign Jon Runyan for the 2009 season as he had microfracture surgery on his knee after last season in February. Even though Runyan was gearing up for a possible Congressional campaign, he kept himself in shape for an opportunity just like this. Well, if you’re healthy Jon, I welcome you to San Diego and hope you can help our oft injured O-Line. Here is Jon’s official statement, courtesy of Hugging Harold Reynolds.